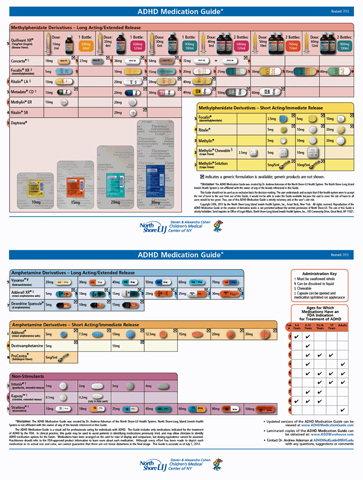 The ADHD Medication Guide is continuously updated to provide current information. It is a visual aid for professionals caring for individuals with ADHD. The guide includes only medications indicated for the treatment of ADHD by the FDA. In clinical practice, this guide may be used to assist patients in identifying medications previously tried, and may allow clinicians to identify ADHD medication options for the future. Medications have been arranged on the card for ease of display and comparison, but dosing equivalence cannot be assumed. Practitioners should refer to the FDA-approved product information to learn more about each medication. Dr. Andrew Adesman is Chief of Developmental & Behavioral Pediatrics at the Steven and Alexandra Cohen Children's Medical Center of New York (CCMCNY), part of the North Shore-LIJ Health System. Dr. Adesman is also the Director of the ADHD Center at CCMCNY.